The gluten free diet has gained enormous popularity as a proven weight loss method. When you eliminate gluten rich foods from your diet, you are essentially cutting your intake of carbohydrates. When you reduce the amount of carbohydrates you eat, you lose weight. But it’s more than that. So, what is gluten, you might ask? The short answer is this. Gluten is a stretchy, stringy protein found in some grains high in starch. The gluten protein is a thickening agent hidden in processed foods. You’ll find it in almost every can or packet of soup, gravy, and sauces. Gluten is the compound responsible for giving breads, pastries and baked goods their shape. Baked goods such as cakes, pizza crust, bagels, bread, wheat pastas, and cookies contain copious amounts of gluten. Once you start a gluten free diet, you’ll discover how many processed foods you need to avoid. The majority of processed foods these days contain harmful artificial preservatives. They also contain flavors, chemicals, colors, and other ingredients to make the foods taste better. These added ingredients have nothing to do with healthy eating. By not eating gluten, you will consume more healthy foods and less processed foods. You also avoid the mystery ingredients associated with processed foods. Eating healthy meals leads to weight loss. People all over the world, especially in the US and other developed countries, suffer from inflammatory diseases and auto-immune disorders. 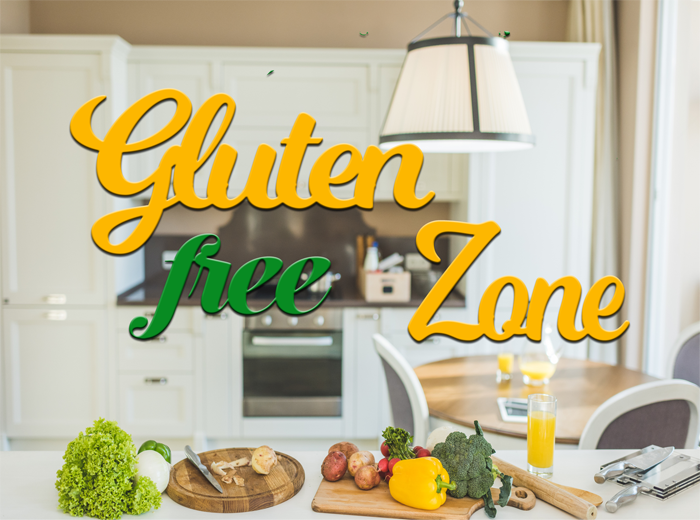 When following a healthy gluten free diet, they find relief from their symptoms. Individuals with celiac disease strictly adhere to a gluten free diet. Others sensitive to gluten also adopt a gluten free diet. People diagnosed with Irritable Bowel Syndrome, Crohn’s disease, Lupus, and other chronic diseases, widely endorse gluten free products. People who switched to a gluten free diet report positive results, and you can too. You can expect to look more radiant and have more energy. Overall, you will feel much better. So take the time you need to educate yourself… to determine if going gluten free is right for you. Many fruits and vegetables provide a host of antioxidants and nutrients and can naturally satisfy any cravings for sweets. Crunchy celery is abundant in sodium and can be a great potato chip replacement as well. Experiment with gluten-free grains and you can continue to enjoy your favorite pasta dishes with slight modifications. Make the majority of your meals from scratch. That’s the easiest, safest, and healthiest way to start a gluten-free weight loss program. Often, many commercially prepared foods that claim to be gluten-free are high in sodium, MSG, and calories. They may contain higher levels of sugar and additional ingredients such as corn starch or potato starch. Prepare your own fresh vegetables and meats; mix up your own salad dressings and marinades. This way you’ll be less likely to ingest all those extra ingredients that are working against your weight loss strategy. It is common for people to feel extremely frustrated when they begin the process of changing their lifestyle and diet. It is especially difficult for those compelled to do so due to ill-health. No doubt, adopting a gluten free diet can be a challenge initially. Many people prefer to prepare their daily meals. This means they need to start reading labels carefully when they go grocery shopping. They soon discover gluten is present in many items they take for granted. It soon feels like there’s nothing left to eat! Fear not… you still have lots of options. It is important to read labels and be open to trying new gluten-free grains and sauces. At first it may be time consuming to read labels every time you shop. But you need to train yourself to do so. In time, you will learn which foods and brands are safe for you to eat. Product ingredients are listed on the label or package by volume. Therefore, the ingredients listed first are the major components of the packaged food. Now days health food and grocery stores have a much better selection if gluten free foods. These include cereals, breads, cookies, and gluten-free pastas. That has not always been the case. You can find websites and recipes online to help you get started. Check out some online forums as they can provide great inspiration for different recipes. Another option is to make an appointment with a local dietitian as part of your education journey. Be patient with yourself and expect this huge dietary transition to take some time. Is A Gluten Free Diet Plan Healthy? For individuals sensitive to gluten and those who have celiac disease, following a gluten-free diet is the only option. And a gluten-free diet is not a fad diet, especially for those who suffer from IBS and other chronic diseases. Rather, it is a necessary healthy lifestyle diet. Eliminating gluten may be a wise decision for anyone, whether or not they suffer from any kind of food sensitivity. Many foods that contain gluten are simple carbohydrates, such as pasta, pizza crust, bread, muffins, cookies and cakes etc. It makes sense that most of us would benefit from eating less of these foods. Gluten sensitivity notwithstanding, almost everyone can benefit if they eliminate or reduce high-starch and unhealthy foods from their diet. It is equally important to start eating more lean meats and poultry, vegetables, gluten free whole grains, seeds, and nuts. In order to achieve and maintain a healthy weight and overall wellness, simply reducing calories is not the ideal solution. You need to ensure that you are meeting all of your nutritional requirements. You need adequate amounts of healthy fats, proteins, fruits, and complex carbohydrates. With proper nutrition, your body feels satisfied and can perform its expected functions well. Simply eliminating certain food groups and not substituting with a healthy alternative will leave you grumpy and susceptible to cravings. This could potentially lead to spikes in your blood sugar. You could be setting yourself up for some unhealthy bingeing down the road. Prior to starting any kind of diet, have a conversation with your doctor. Make sure you get the go-ahead to proceed. This is especially necessary if you have any significant health issues. Ideally, when you decide to lose weight, you should focus on exercise and healthy eating habits. You should think in terms of a lifestyle change that you can sustain long into the future. If you are trying this as crash diet to lose weight, you probably won’t get the results you desire. Your food choices are the key to weight loss with a gluten free diet… I can’t stress this enough. Yes, you can buy gluten free products in the grocery store. Just be careful; don’t stock up on these foods and make them your primary source for meals. Processed foods, gluten free or not, are not good for you. If you decide to adopt a gluten free diet and lose weight, I suggest you look into the Whole30 Program. I know it works for me and may be just what you’re looking for. Read the rules and decide for yourself. What is the Downside to Going Gluten Free? Many individuals are changing over to a gluten free diet in order to live a healthier lifestyle. But is there a downside? Are there areas which you should be concerned about? Switching to a gluten free diet will have you eating more fresh fruits and vegetables. This is of course a great thing. However, there is one area of gluten free living that might concern you. You need to make sure you are getting enough iron and minerals into your diet. Products like breads and pastas are fortified with irons and minerals, especially the B and D vitamins, along with zinc. This has prevented the population from suffering from vitamin deficiencies. Because those eating gluten free avoid these products they need to make alternate food choices to replenish these vitamins. Quite often new gluten free eaters find themselves with low iron levels. It’s important to look at your total diet; ensure that you are not leaving any essential vitamins or minerals out. It’s probably a good idea to take a high quality vitamin supplement. Another concern might be eating out. Going out to eat at a restaurant can be a tricky situation. This is true if you are extremely sensitive to gluten and cannot eat even small amounts of foods containing gluten. Kitchen staff needs to be aware of the dangers of cross contamination. Making wise choices at the restaurant will be important. Knowing what you can and cannot eat from the menu will help make your decision easier. Also, you should mention your intolerance to your server. They know the menu and could make recommendations. Many restaurant owners understand the food concerns of their gluten-sensitive customers. It’s easier today to find restaurants, and, yes, even pizzerias, that have adopted dishes to meet those dietary needs. At one time it was harder for people to change over to a gluten free way of living. However, today the trend for gluten free living is on the increase. This has led to manufacturers creating more gluten free products. It is now possible to find items such as bread, cookie, and cake mixes which are gluten free. Other items include gluten free waffles and crackers. Instead of having to visit your local health food store, traditional grocery stores now carry gluten free foods. They also carry a large choice of organic products which makes your grocery shopping easier. If you are new to the gluten free lifestyle make sure that you are eating a good assortment of foods. You don’t want to develop a vitamin deficiency. If you are concerned, use the best supplement you can afford. Does going gluten free take time and effort? Yes, it does. But given all the health benefits of adopting a gluten free lifestyle, it’s well worth the effort. And keep this mind… everyone on the planet needs water to survive; no one on the planet needs gluten to survive. So I say, if you don’t need it, don’t eat it.